Lower back pain can play a major role in your everyday life, especially if it’s chronic. Do you find yourself constantly trying to find relief, whether it’s the position you sit in at work or the way you sleep at night? While small changes can make a difference, the surface you sleep on at night can have a major impact on the way your back feels in the morning and throughout the rest of the day. If you aren’t ready to invest in a new mattress, then take a look at the mattress toppers below. These are some of the best for resolving lower back pain. This mattress topper is an excellent choice for those who suffer from back pain, as it is made from high-quality memory foam that helps eliminate pressure points all along the back and joints. In addition to this, the soft and cushy memory foam supports the lower back in every position you sleep in, which allows the spine to stay neutral. This topper is also ventilated to allow air to flow through while you sleep and reduce the chance of overheating. The 3″ memory foam design is soft yet firm so you’re fully supported no matter how long you rest. Named for its design, this mattress topper is thick and provides the ideal amount of cushion for those who suffer from lower back pain. It’s 3″ deep and features soft pointed peaks that reduce pressure on your back and provide you with the support you need to achieve deeper sleep. Made of high-quality urethane that’s medical grade, this is a topper that you can feel safe sleeping on. It’s also CertiPUR-US certified because it’s made without lead, heavy metals, formaldehyde, phthalates, PBDEs, TDCPP, and TCEP flame retardants. 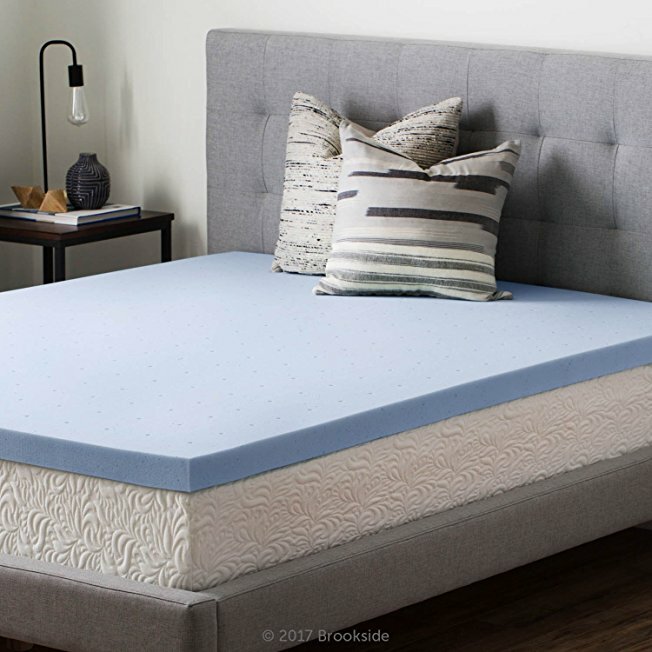 With 2.5″ of gel-infused memory foam, this mattress pad will conform to every curve of your body to help better support your lower back as you sleep. As a result, this can help you feel more energetic while reducing your pain throughout the day. If you’re worried about sweating at night, this topper is ventilated to facilitate air flow and help regulate the temperature of the mattress. This product is also CertiPUR-US certified and a healthy surface to sleep on because it’s made without harmful chemicals. While a new mattress topper may not completely eliminate your lower back pain, it can help immensely with the intensity and duration of the pain you experience. Those listed above are some of the best options, with great reviews from those who have used them.